Sharjah Oasis Real Estate Developments, developer of Sharjah Waterfront City, the largest mixed-use masterplanned waterfront community in Sharjah, announced that 65 per cent of its Phase One – 321 villas on Sun Island – has been sold out. The master developer also announced that it will offer up to five per cent discount on three- and four-bedroom hall beachfront villas on the remaining properties – construction of which is going on in full swing. These properties are slated for delivery in the fourth quarter of 2019. The company will be making a strong sales campaign at the Acres Middle East real estate exhibition, to be held at the Sharjah Expo from March 21-23, where it expects to sell the balance properties and unveil a new cluster. “Our latest offer is unbeatable – even for any properties in the Northern Emirates. 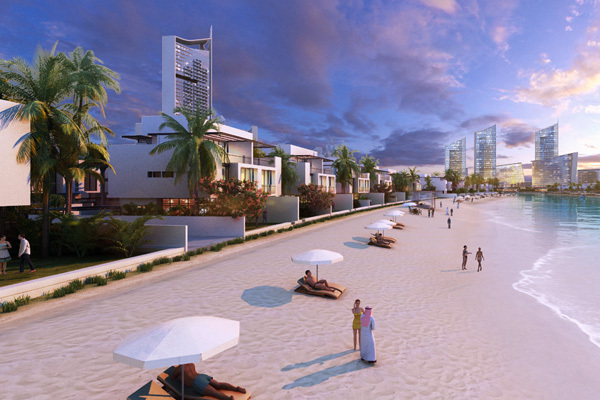 We want end-users to start buying beachfront homes and enjoy a superior lifestyle on the beach and within a gated waterfront community that includes a water theme park, a large shopping mall, 14 hotels, retail district, plenty of choices in food and beverage options to choose from – all spread across eight islands and on the beachfront landscape,” Sheikh Abdullah Al Shakrah, chairman of Sharjah Oasis Real Estate Developments, said. The villas on Sun Island comes with a private beach, landscaped gardens, the latest smart home technologies and all other amenities and facilities of a modern villa. Sultan Al Shakrah, chief executive officer of Sharjah Oasis, said: “Since the commercial launch of the project, we have received tremendous response from property buyers, investors and brokers and it is due to the high demand for quality homes, we are planning to fast-track the release of new homes ahead of schedule. “The tremendous response from brokers – who understand the nerve of the market – is a living testimony of the significance of the project and its distinct appeal as the best waterfront project in the region. The company is offering attractive incentives to real estate brokers with commission depending on the number of sales concluded, it said. Alaa Massoud, general manager for sales and marketing at Sharjah Oasis Real Estate, said the offer comes with a lot of value addition. “The prices of these beachfront villas will multiply by the time they are delivered.